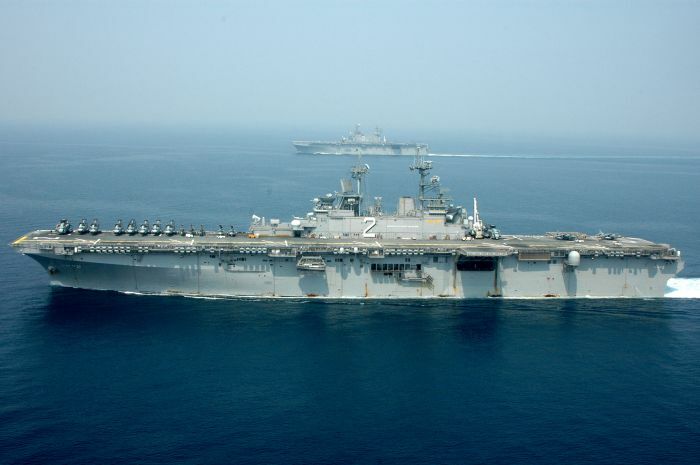 Arabian Gulf, 09 September 2004) — The amphibious assault ships USS Essex (LHD 2), foreground, and USS Belleau Wood (LHA 3) sail side-by-side in the Arabian Gulf during cross deck maneuvers. Cross decking is used to share supplies, personnel and equipment without having to pull into a port. This is the first time in history Essex and Belleau Wood have traded supplies in this manner. Essex is currently deployed in the Arabian Gulf in support of Operation Iraqi Freedom (OIF). After the commissioning in 1992, ESSEX conducted an arduous and highly successful training program, leading to her maiden deployment in October 1994. With the 13th Marine Expeditionary Unit (Special Operations Capable) embarked, ESSEX showcased her abilities on numerous occasions. The highlight of the deployment came in January of 1995, when she left the Gulf to prepare for the complex task of covering the withdrawal of UN multinational force from Somalia in Operation United Shield. Under fire from advancing Somalis, every member of the force was successfully extracted. ESSEX returned to San Diego on April 25, 1995. After a short Maintenance period, ESSEX embarked on a vigorous workup cycle, culminating in her participation in RIMPAC ’96, a biennial, seven-nation naval exercise. On October 10, 1996, she embarked on her second Western Pacific deployment, with the 11th MEU (SOC) and Amphibious Squadron FIVE. During the deployment, ESSEX participated in multinational exercises with Qatar, Oman and Kuwait, as well as Exercise Tandem Thrust ’97, an American-Australian combined exercise with over 28,000 troops, 250 aircraft and 40 vessels participating. Upon her return in April 1997, ESSEX again went into a short maintenance period, followed by a shortened workup cycle. She then departed for her third Western Pacific, Indian Ocean and Arabian Gulf deployment on June 22, 1998 with the 15th MEU (SOC) and Amphibious Squadron FIVE. ESSEX participated in Exercises Sea Soldier and Red Reef, and participated in Military SALT and Non-Combatant Evacuation Operations with the U.S. Embassy in Kuwait. Additionally, ESSEX supported Operation Southern Watch, enforcing the UN-mandated no-fly zone in southern Iraq. On July 26, 2000, after successful completion of the largest hull swap in U.S. navy history, ESSEX replaced Belleau Wood (LHD 3) and inherited the distinctive role as the Navy’s only permanently forward-deployed Amphibious Assault Ship in Sasebo, Japan. In the role, ESSEX participated in humanitarian assistance/disaster relief operations in East Timor in October and November 2001 and Foal Eagle in Korea in 2002. Since her commissioning, ESSEX has received numerous awards, including all of the warfare excellence awards, six Battle “E” awards, the Golden Anchor Award for retention, The Navy Award for food service excellence, the Thompson Award for public affairs excellence, the Ogden Award for firefighting excellence, and the Chief of Naval Operations and Commander, Naval Surface Forces Pacific Safety Award.